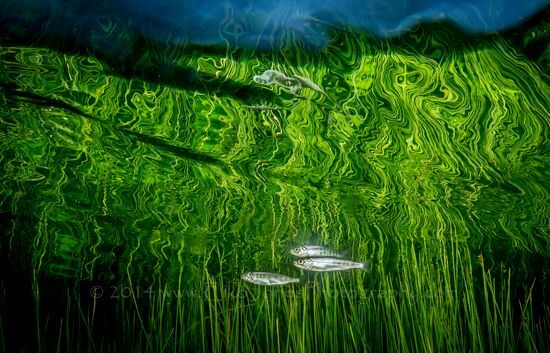 Coho Salmon smolts with reflections of sedge in the estuary of the Campbell River. Finding hidden gems in freshwater locations can be easier than you would think. 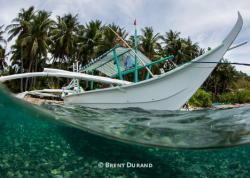 Fresh water diving is considered by many to be less exciting and glamorous than ocean diving. Nevertheless, there are some amazing experiences to be had and a great many beautiful photo opportunities waiting for you in your local stream, lake or even swamp. You just have to be willing to try new places and literally go with the flow. Floating down a river is an experience akin to flying. Here are a few tips and tricks to keep in mind when considering grabbing your camera and heading into a fresh water environment. If you are going into a river or even a small stream, be very aware of the incredible force of moving water. Even knee-deep water that appears to be moving slowly makes it difficult to maintain your position once submerged. Because of this, you must be prepared to go with the flow instead of fighting to stay put. Before any shoot, an initial recon of the stream is essential so that you are aware of obstructions and other hazards. Trying to keep hold of a big camera system in moving water is very taxing, so be prepared for a work out. It’s a good idea to adjust camera settings before you start moving so that you can shoot as you drift, since you might not have time to do this when a photo opportunity presents itself. The rewards are worth the effort though. Pink salmon otherwise known as a Humpy heading upstream in the Quinsam River. 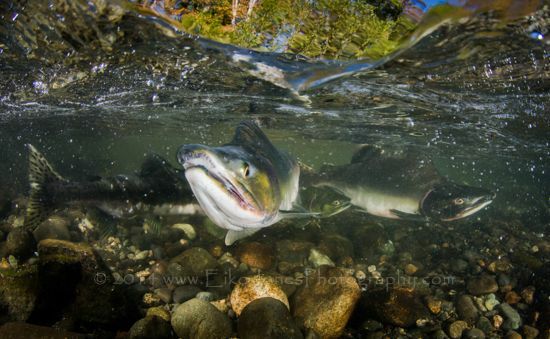 Coho salmon male showing off spawning colours in the Quinsam River. 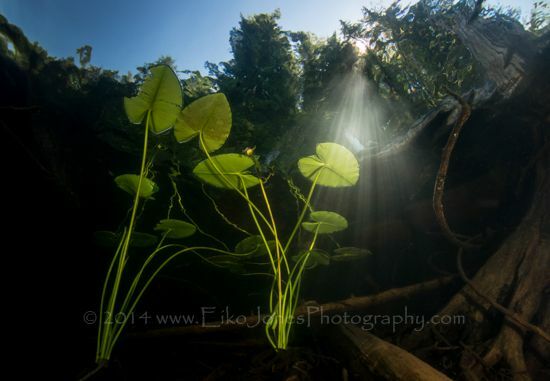 In swamps and lakes this can be a difficult thing for photographers to manage. The slightest hand movement can send a cloud of fine silt up and destroy the shot you were just about to take. 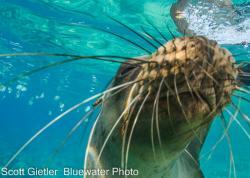 Use proper buoyancy and move forward very slowly so you don’t have to make rapid movements to stop. Even in water 2-4 feet deep I often use Scuba gear so I can be down on the bottom and avoid duck diving down to compose shots. 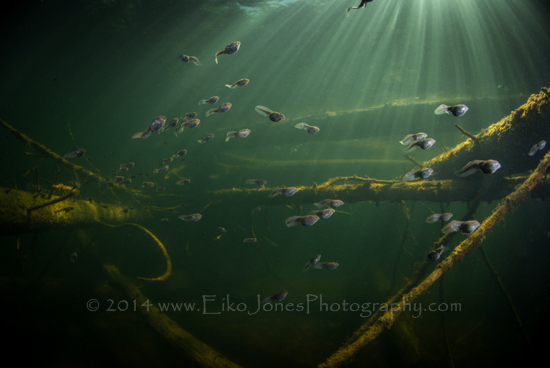 Tadpoles streaming through submerged logs at the margin of a lake. 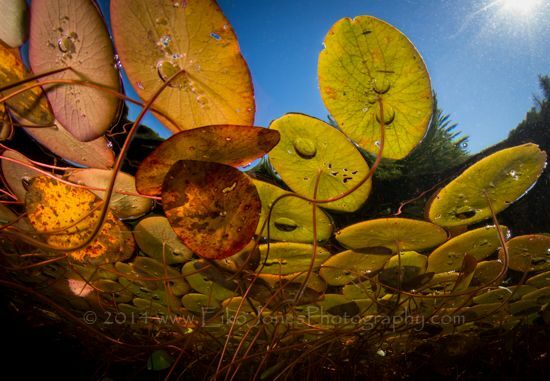 Sunlight streaming through the trees highlights the lilies in this shallow pond. 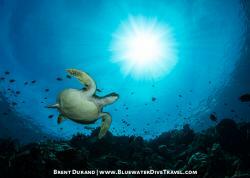 Because a lot of fresh water diving is in shallow water, there is usually an abundant amount of light. Use this to your advantage by looking for dramatic scenes that highlight the sun streaming into the water. 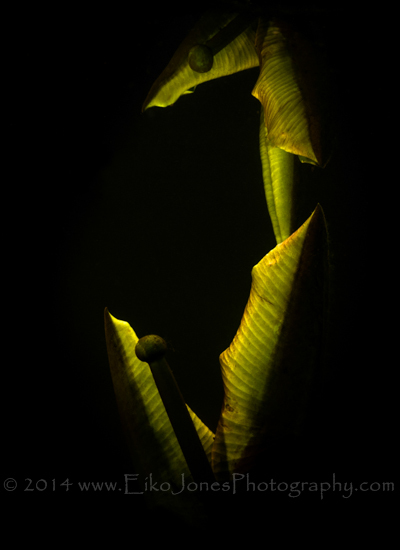 The use of high shutter speeds and small apertures in brightly lit water means you will have to crank up your strobes to near max power if you want to light up the underneath of lily pads and such. Or switch off the strobes and capture the subtleties of the sunlight filtering down through the vegetation or into the depths. Lilies highlighted by sun and strobe lit for detail. Canyon depths lit by sunlight streaming through the surface. By lying on your stomach and resting your elbows on the bottom, you can concentrate on getting that perfect split-spot. A large glass dome is preferable as it is more durable in the rough and tumble environment and also makes for a finer transition between sky and water. 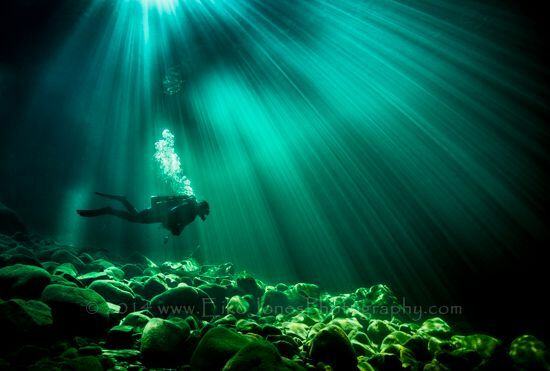 Lighting the underwater half is also easier in a shallow, brightly lit river. Lastly, by lying in one spot and setting up a nice composition, you just have to wait for the fish to swim close by the dome instead of swimming around trying to chase the fish. 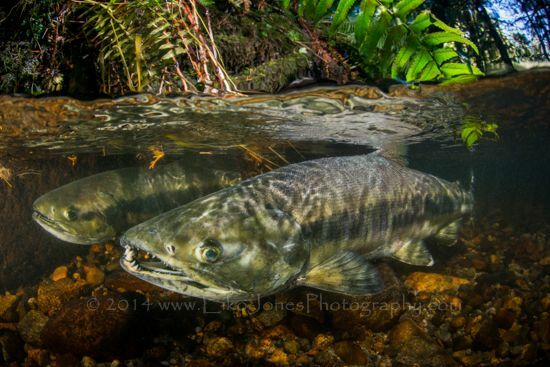 Chum Salmon pair hanging out in the spawning beds of a small shallow stream. Pink Salmon split shot. 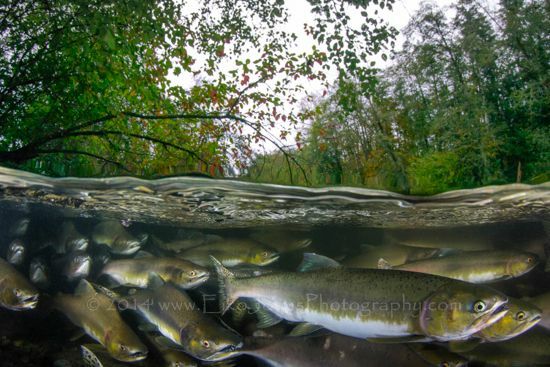 Taken while over a million fish were migrating up the Quinsam River in 2013. So consider returning to that magical spot you found one summer in the middle of winter or in the spring when all the new growth is emerging. Sometimes the change is so great it feels like diving in a new location. 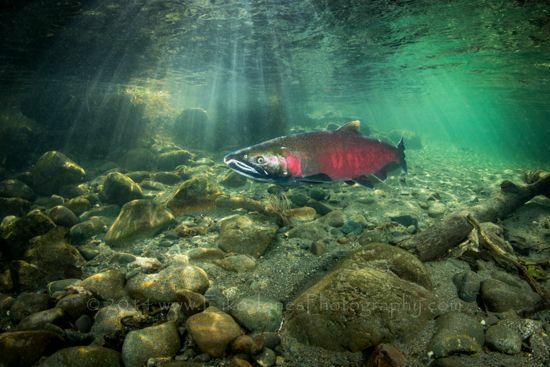 Fish like salmon and trout also are in the river system in their various forms throughout the year. Yellow water lily emerging from the muddy bottom of a shallow pond that completely clogs up after spring. Coho Salmon smolts that spend their first year in the river system before heading out to sea to grow and mature. 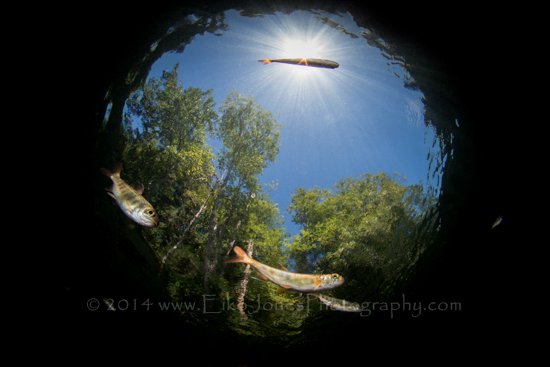 One response I receive a lot when people view my images from the local watershed is amazement at what lies beneath the surface of some benign-looking waterways. The appreciation for the entire ecosystem you get from spending time in freshwater is immense, and if you can bring a little bit of this to others through beautiful images then that is worth the effort.